What Rights Do Dads Have? In today’s progressive society, more and more dads are asking for and getting full custody of their kids. And for those that aren’t, dads are asserting more rights than ever. This is not to say the role of the mother is being eliminated, but the trend in family law is definitely an increased exercise of rights by fathers. This is especially true in cases where the parents are not legally married. In that instance, it is important for the dad to know his rights, and how to exercise them properly. ● Establish paternity: while signing the birth certificate is an acknowledgement of parentage, it is not conclusive proof. If you are trying to enforce your rights as a dad, you will need to file a petition to establish paternity. ● An informal agreement is not binding: a handshake, or an “understanding” between unmarried parents about the child is not legally binding. Fathers seeking recognition must take formal legal action and have any agreement reduced to a court approved writing. 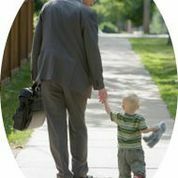 ● Issues of child support: you do not have the absolute right to visitation just because you pay child support. All agreements regarding support and visitation, to be enforceable, must be contained in a court approved order. You are also not required to pay child support just because you are given visitation. This does not mean dads are relieved of their financial duty for their kids, it just means the amount and terms of support are not dependent upon the terms of visitation. All issues regarding your children are required to be in writing, and given the Court’s seal of approval. This means you have to file a case to establish paternity, or to determine support and visitation, as well as other important issues such as custody and how the parents exercise decision making authority. For more information about the rights of dads, contact a Stuart and Treasure Coast family law attorney with experience. Whether you are an unwed father, or simply want to play a more active role in your child’s life, you need the help of a qualified attorney to present your case to the Court. The fee for your fist visit is a flat fee and we work with you for a cost effective result.